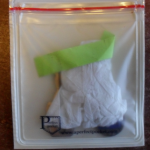 Perfect Pocket: the Perfect Solution for Runners! I’m not a fan of cyclists! They are like big swarms of bees, and their clothes are ugly as sin. However, there is one thing I envy them for. And that’s their ability to take stuff with them! That’s why I’m a stickler for pockets in my running clothes. You know, to put my house key in and some spare change. But what if you have a great running outfit, without any pockets? Then you just stick a pocket on your body! That’s the solution Lesley and Lois came up with! They invented and developed the Perfect Pocket. And I got the opportunity to try one out! Perfect Pocket: what’s that when it’s at home? The Perfect Pocket is a seethrough pocket. You can put your stuff in it, and close it again. Lois and Lesley went through great efforts to make sure the adhesive was hypoallergenic. They tried out 35 skin save adhesives and narrowed it down to 4. Then they had 16 focus groups try out the final four adhesives under various conditions. I had great fun watching Lois and Lesley’s movie. 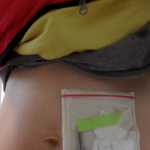 They explain very well why the Perfect Pocket may come in handy for runners. And the movie is very funny. Have a look and a laugh! The Perfect Pocket arrived in a plain envelope. Then I spotted the Perfect Pocket logo! I hate manuals, so I thought it was great the instructions were simply printed on the Perfect Pocket. I read you should put your stuff in the Perfect Pocket before sticking it to your body. The time had come! I was going to stick the Perfect Pocket to my skin. At first I thought I’ld stick it to my tigh. But since I was wearing my Zaggora Hotpants, I reconsidered. So I put the Perfect Pocket on my stomach. I just slapped it on, and it stuck! At first it felt a bit funny. And it made me think of hospitals a bit. But that’s probably because I put it on my stomach. At first I was very conscious of it being there, but soon I forgot all about it. After a 40 minute run, I came home and pulled off the Perfect Pocket. This was a little bit painful, but I think the best thing to do is to pull it off in one quick movement. The Perfect Pocket in action! After my run: Perfect Pocket still there! I still like pockets in my running clothes best, but I love the Perfect Pocket too. In a way the Perfect Pocket may even be safer, because it’s hidden on your body. I like the freedom the Perfect Pocket offers. You may even go running naked, wearing only your Perfect Pocket! I would love to see the Perfect Pocket in different sizes. Sometimes all you have to take with you is a key. In such cases a smaller Perfect Pocket would be great too. I think the Perfect Pocket may be a big hit amongst people who like to go clubbing! 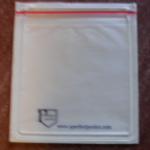 You can order your Perfect Pocket at aperfectpocket.com. For $9.99 you get four! How to Protect Your Bike and Your Wallet!